Note: regulatory information regarding use of this nongame fishing method/device for shad and herring are not the same as the information below. 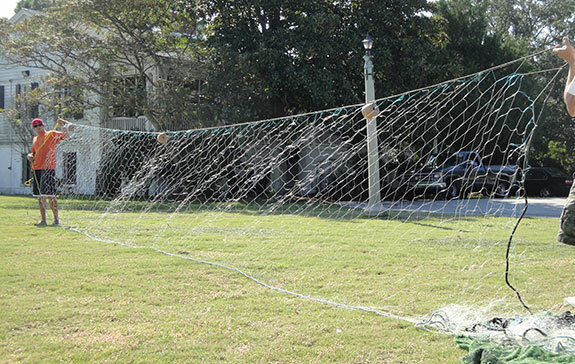 Nets must have a mesh size not less than 4-1/2 inches stretch mesh. The maximum length is 100 yards in the freshwater and no net, cable line or other device used for support of a gill net may extend more than halfway across any stream or body of water. Nets must be marked with a white floating marker. A gill net used in the freshwaters must have a mesh size not less than four and one-half inches stretch mesh. A gill net measuring more than one hundred yards in length must not be used in the freshwaters and a gill net, cable, line or other device used for support of a gill net may not extend more than halfway across any stream or body of water. A gill net may be placed in the freshwaters on a first come first served basis but a gill net must not be placed within two hundred yards of another gill net. However, notwithstanding another provision of law, along the Little Pee Dee River upstream of Punch Bowl Landing, no net may be set within seventy-five feet of a gill net previously set or drifted within seventy-five feet of another drifting net. Use or possession of a gill net at any place or time other than those prescribed in this subsection is unlawful. Nongame fish taken in shad nets lawfully fished during the open season for taking shad may be kept. A sturgeon caught must be returned immediately to the waters from where it was taken. The season for taking nongame fish other than American shad and herring in the freshwaters of this State with a gill net is from Nov. 1 to Mar. 1 (where authorized) on Wednesdays, Thursdays, Fridays, and Saturdays only. A fishing license is required of all persons who fish nongame fishing devices. Some devices are not permitted on certain waters. Commercial fishing license when fishing 4 or more gill nets or a total of more than 100 yards of net. A gill net tag (PDF) is required. Recreational limit 3 nets and no more than a total of 100 yds of net.